One of the primary concerns that often prevents people from seeking orthodontic care with traditional metal braces is the aesthetic impact of the treatment. At Smile Center of Knightsville, we offer the alternative of Invisalign® clear aligners as an inconspicuous way to straighten your smile. With this nearly invisible aligning system, Drs. Jeanine and Jeffrey Gourdine, can provide a convenient, customized treatment option to produce meaningful orthodontic results for patients in Summerville and surrounding communities. Drs. Jeanine and Jeffrey Gourdine recommend this clear aligner system in many of the same situations where traditional braces would be used. However, as a metal-free and removable option, Invisalign® trays address mild orthodontic problems while offering patients improved visual appeal and convenience. Gaps between teeth – Unwanted spaces may occur in your smile due to teeth that are missing or have moved as part of relapse following previous orthodontic treatment. Overcrowding – Identifiable by teeth that appear rotated, overcrowding can make practicing effective at-home oral care difficult, increasing the likelihood of gum disease. Crossbite – Uneven wear can result when the bite of one or multiple upper teeth is situated inside the lower teeth. Over time, this may lead to bone erosion and gum disease. Overbite – This problem occurs when the upper teeth project further than, or completely cover, the lower teeth. This can contribute to discomfort in the jaw and TMJ disorders. Underbite – Similar to an overbite, but involving the projection of the lower teeth beyond the upper teeth, sometimes completely covering them, this issue poses the same risks to jaw health. At your initial consultation visit, our Summerville dentist will work with you to develop a treatment plan, customized to ensure your aligner trays are suitable for both your comfort and your long-term oral health goals. For the accurate design and creation of your unique set of aligners, three-dimensional images will be taken of your entire jaw and sent out to a trusted dental laboratory. These images can also be used to showcase the progression of the treatment so you can see the final result. As part of the adaptive nature of the Invisalign® system, Drs. Jeanine and Jeffrey Gourdine will review the progress achieved every two weeks and provide new trays to fit your changing dentition. Once the treatment plan and images are established, the dentist will send them out to create your custom set of trays. Based on your individual situation, as many as 29 or as few as 20 sets of clear aligners may be made per arch. 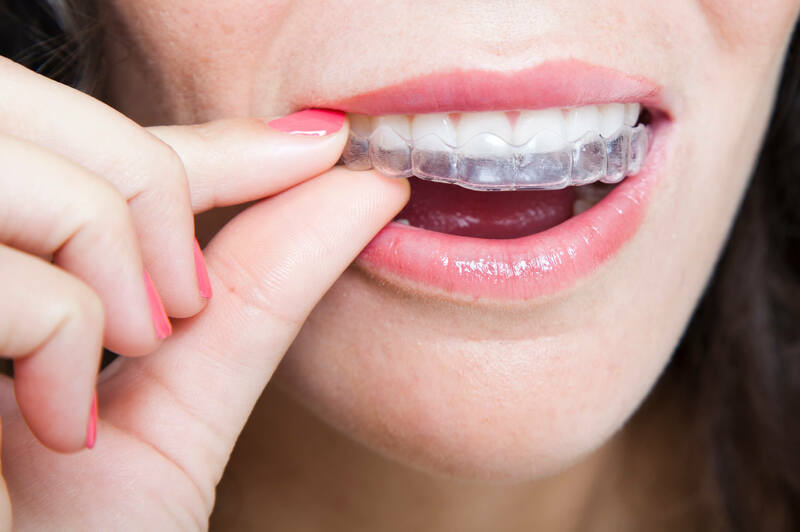 While the ability to remove Invisalign® trays allows patients to enjoy the ability to undergo orthodontic treatment without dietary restrictions, wearing your aligners consistently is key to receive optimal results. We recommend patients wear their aligners for at least 22 hours a day. Food particles trapped between the tray and your teeth can cause tooth decay, which is why we recommend that our Summerville patients remove their Invisalign® trays before eating or drinking. Maintaining proper oral as well as appliance hygiene is also important to improve the benefits of treatment and reduce the risk of bacterial build-up. Contact our Summerville Dental Practice Today! At Smile Center of Knightsville, our treatment plans that include Invisalign® provide patients with a comfortable and effective method to achieve their smile goals. For more information on the benefits of attaining straighter teeth through this clear aligner system, call our Summerville dental practice today to schedule an appointment.